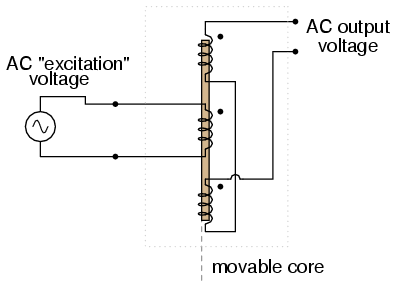 A variation on the LVDT is the RVDT, or Rotary Variable Differential Transformer. This device works on almost the same principle, except that the core revolves on a shaft instead of moving in a straight line. RVDT's can be constructed for limited motion of 360o (full-circle) motion. 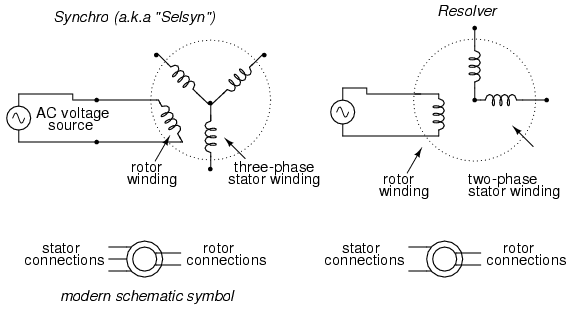 Continuing with this principle, we have what is known as a Synchro or Selsyn, which is a device constructed a lot like a wound-rotor polyphase AC motor or generator. The rotor is free to revolve a full 360o, just like a motor. On the rotor is a single winding connected to a source of AC voltage, much like the primary winding of an LVDT. The stator windings are usually in the form of a three-phase Y, although synchros with more than three phases have been built. 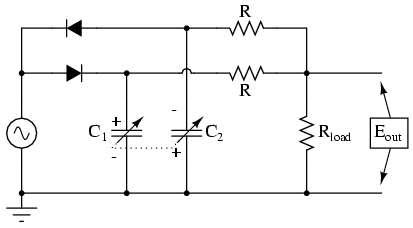 (Figure below) A device with a two-phase stator is known as a resolver. A resolver produces sine and cosine outputs which indicate shaft position. 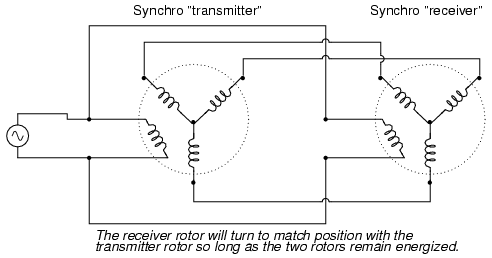 A synchro is wound with a three-phase stator winding, and a rotating field. A resolver has a two-phase stator. A synchro or a resolver may measure linear motion if geared with a rack and pinion mechanism. A linear movement of a few inches (or cm) resulting in multiple revolutions of the synchro (resolver) generates a train of sinewaves. An Inductosyn® is a linear version of the resolver. It outputs signals like a resolver; though, it bears slight resemblance. The Inductosyn consists of two parts: a fixed serpentine winding having a 0.1 in or 2 mm pitch, and a movable winding known as a slider. 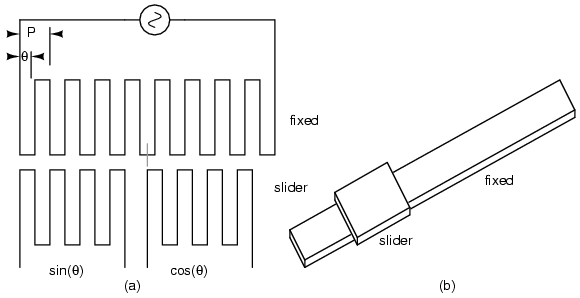 (Figure below) The slider has a pair of windings having the same pitch as the fixed winding. The slider windings are offset by a quarter pitch so both sine and cosine waves are produced by movement. One slider winding is adequate for counting pulses, but provides no direction information. The 2-phase windings provide direction information in the phasing of the sine and cosine waves. Movement by one pitch produces a cycle of sine and cosine waves; multiple pitches produce a train of waves. When we say sine and cosine waves are produces as a function of linear movement, we really mean a high frequency carrier is amplitude modulated as the slider moves. The two slider AC signals must be measured to determine position within a pitch, the fine position. How many pitches has the slider moved? The sine and cosine signals' relationship does not reveal that. However, the number of pitches (number of waves) may be counted from a known starting point yielding coarse position. This is an incremental encoder. If absolute position must be known regardless of the starting point, an auxiliary resolver geared for one revolution per length gives a coarse position. This constitutes an absolute encoder. 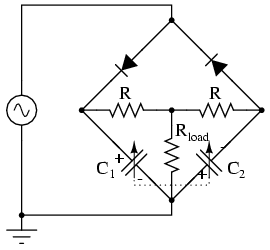 A linear Inductosyn has a transformer ratio of 100:1. Compare this to the 1:1 ratio for a resolver. A few volts AC excitation into an Inductosyn yields a few millivolts out. This low signal level is converted to to a 12-bit digital format by a resolver to digital converter (RDC). Resolution of 25 microinches is achievable. Variable capacitive transducer varies; (a) area of overlap, (b) distance between plates, (c) amount of dielectric between plates. 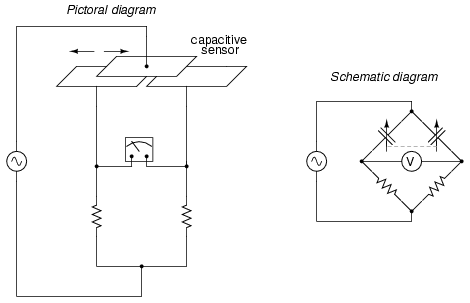 Differential capacitive transducer varies capacitance ratio by changing: (a) area of overlap, (b) distance between plates, (c) dielectric between plates.